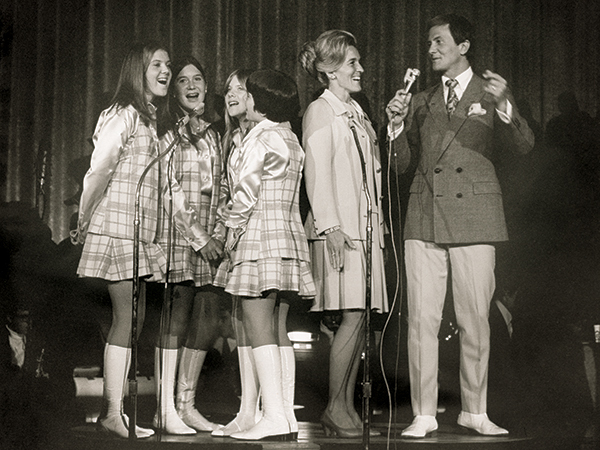 Pop music star Pat Boone and his family performed on Saturday night at Sing Song in 1970, which was televised live in Abilene. As a rich tradition since 1956, about one-third of Abilene Christian University’s student body participates in Sing Song each year, during which a top men’s social club, women’s social club and mixed-voices group are crowned for having the best song medley. Over the next few days, we’ll look at highlights from six decades of this popular event. ACU students’ creativity thrived during the 1970s, and (for better or worse) Sing Song was a perfect outlet for that creative thought process. The show was permanently located in its new home – Moody Coliseum – and everything seemed bigger and better in Moody. The show was televised in 1970 and 1971 on KTXS-TV. Dr. Gary McCaleb (’64) directed the show in 1970 (and continued through 1972.) The scoring process for competition was tabulated by hand in those days, and often took 30 minutes or so. During that process, special guests or celebrity hosts would sing for students and guests while waiting for the results to be delivered. 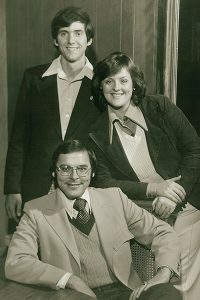 1975 Sing Song co-chairs David Litton and Liz Campbell, and director Herb Butrum. 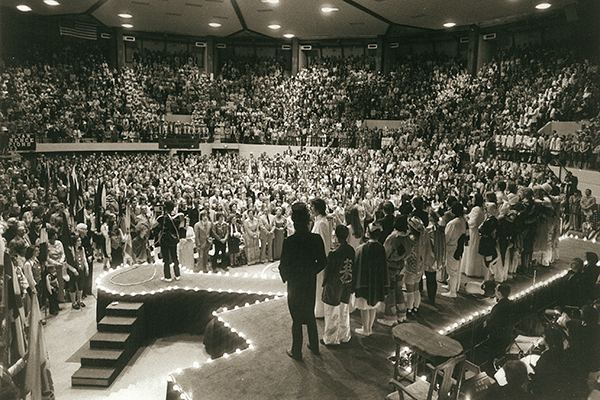 By the 1971 show, the Moody Coliseum/Sing Song relationship was solidified with the creation of what is now known as the Sing Song stage. As groups found their footing on their new stage, creativity continued to flow, but all creativity was not so positive. During the 1971 Saturday night show, an anonymous person notified ACU officials a bomb has been placed in Moody Coliseum. The call came just after 10 p.m., and about 4,000 guests were evacuated. Moody was searched, then the crowd returned for the conclusion of the show. The threat was determined to be a prank. “We asked people to go to the Campus Center,” McCaleb said. “And without a bit of problem, the entire crowd calmly filed out. It was truly an amazing thing.” ACU’s student newspaper, The Optimist, reported that Moody was evacuated in 10 minutes. Class member Liz (Campbell ’75) Rotenberry said the freshmen took multiple songs and created a medley of tunes. That was new and unique in 1972, but it started a trend that continues today – splicing together popular tunes into one arrangement. 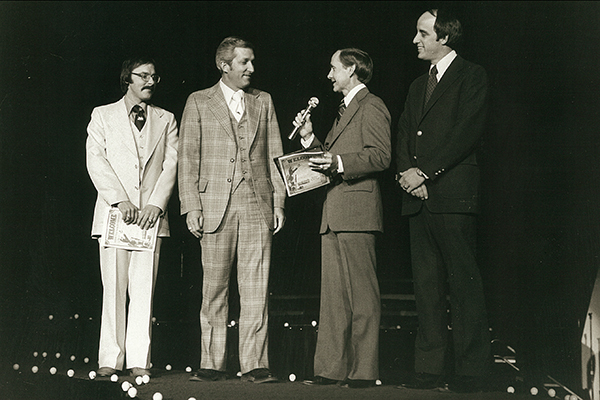 After McCaleb completed his ninth show in 1972, the reins were passed to Herb Butrum (’71) for the 1973 show. Butrum continued directing for five shows. 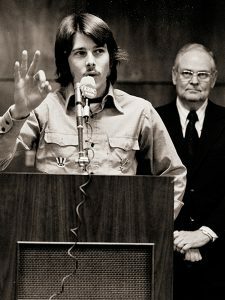 University president Dr. John C. Stevens (’38) looks on as Students’ Association president Kelly Utsinger speaks about the Sing Song controversy in 1975. Rotenberry went on to be a Sing Song co-chair with David Litton (’75) for the 1975 show. Co-chair is the highest student leadership position in the Sing Song structure. That year had its own dramatic flair. 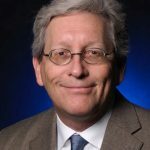 Due to disgruntlement among students concerning a canceled concert, Students’ Association president Kelly Utsinger (’75) called for a boycott of Sing Song. The administration responded by saying students could choose not to participate and necessary adjustments could be made. In the end, students voted to take part, and they performed to the largest Sing Song audience up to that time. In 1976, a three-show format was introduced, but more significant that year, senior director Dale Martin (’76) and his class won the overall mixed-voices category, making them winners their freshman, sophomore, junior and senior years, although they tied with another class their sophomore year. In Sing Song lingo, that’s called a sweep. The reins were transferred again in 1978, with John Duty (’74) taking the role of Sing Song director to oversee five consecutive shows. And as the 1970s melted into the 1980s, the creative pushes gave way to more defined Sing Song rules, giving the show more structure for future generations. Sing Song 1976 coincided with Abilene’s Bicentennial. Here, Butrum, Abilene Bicentennial Committee representative Bob McCathren, Dr. Robert D. “Bob” Hunter (’52) and McCaleb share the stage. Hosts and hostesses for Sing Song 1976 were (from left) John Vaughn (’76), Cindy (Blanton ’76) Zahodnik, Janna (Hopson ’77) Rosier and Darren Lackey (’76), pictured here with director Herb Butrum. Saturday night finale at Sing Song in 1976. 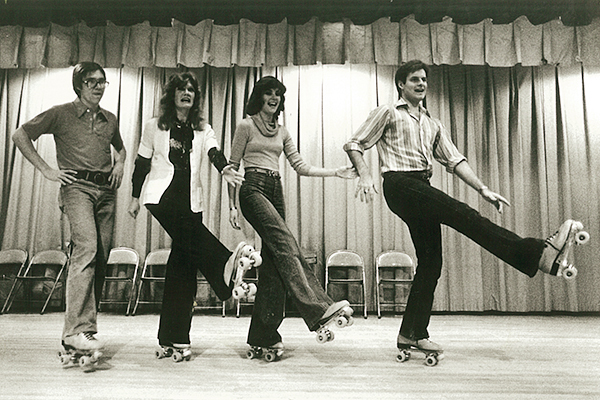 1978 Sing Song hosts and hostesses rehearse on roller skates (from left): Jeff Nelson (’79), Colleen (Smith ’76) Crawford, Holly Dunn (’79) and Don Piper (’78). View more from Tom Craig. I would love to know more about the “canceled concert” that sparked students’ boycott. Can anyone tell me more?